This bundle includes one 8 fl. oz. 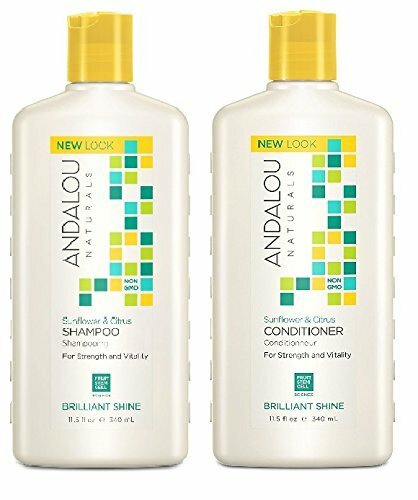 Andalou Naturals Sunflower and Citrus Brilliant Shine Shampoo and one 8 fl. oz. Andalou Naturals Sunflower and Citrus Brilliant Shine Conditioner with Fruit Stem Cell Serum, Vitamin E, Acai, Goji Berry and Rosehips, making it the perfect all natural shampoo and conditioner set for increasing shine without harmful sulfates and parabens. Andalou Naturals Fruit Stem Cell Science improves hair follicle longevity and vitality for healthy hair from root to tip. Citrus gently clarifies and brightens, invigorating follicles and circulation. Nourishing sunflower, rich in Vitamin E, conditions each strand, minimizing split ends and frizz, enhancing color and body with brilliant shine. 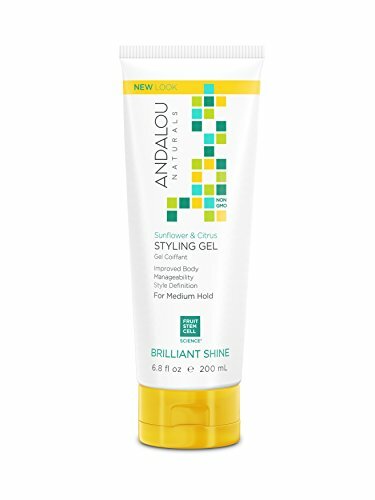 Andalou Naturals Fruit Stem Cell Science improves hair follicle longevity and vitality for healthy hair from root to tip. Citrus gently clarifies and brightens, invigorating follicles and circulation. Nourishing sunflower, rich in Vitamin E, conditions each strand, minimizing spilt ends and frizz, enhancing color and body with brilliant shine. Andalou Naturals embodies beauty in action. We infuse the best of nature and knowledge into mindful and effective products that are good for people and the planet. We value knowing where our ingredients come from, the farmers who grow them, and connecting the human chain of hands that make every step possible from farm to bottle, soil to skin, and botany to beauty. Our skin care, hair care and body care products are made thoughtfully and beautifully, blending advanced Fruit Stem Cell Science with natural and fair-trade ingredients, with a minimum 70% certified organic content, for visible and healthy results. Ingredients: Aloe Barbadensis Juice*, Aqua, Helianthus Annuus (Sunflower) and Simmondsia Chinensis (Jojoba) Oils*, Stearylkonium Chloride, Nigella Sativa (Black Cumin) Oil, Cetyl Alcohol, Glyceryl Stearate, Chamomilla Recutita (Chamomile) Extract*, Glycine Soja (Soy) Protein, Pyrus Cydonia (Quince) Extract, Shorea Stenoptera (Illepe) Butter, Panthenol (Pro-Vitamin B5), Hyaluronic Acid, Tocopherol (Vitamin E), Linum Usitatissimum (Flax) Oil*, Malus Domestica (Apple), Solar Vitis (Grape) and Vaccinium Myrtillus (Bilberry) Fruit Stem Cell Cultures and BioActive 8 Berry Complex*, Aspalathus Linearis (Rooibos) and Hibiscus Rosa-Sinensis Extracts *, Ascorbic Acid, Sodium Benzoate, Citric Acid, Potassium Sorbate, Ethylhexylglycerin, Citrus Aurantium Dulcis (Orange) and Citrus Tangerina (Tangerine) Oils*.